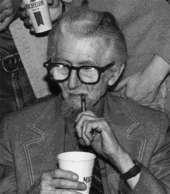 Frank Belknap Long was a prolific American writer of horror fiction, fantasy, science fiction, poetry, gothic romance, comic books, and non-fiction. Though his writing career spanned seven decades, he is best known for his horror and science fiction short stories, including early contributions to the Cthulhu Mythos. During his life, Long received the World Fantasy Award for Life Achievement (at the 1978 World Fantasy Convention), the Bram Stoker Award for Lifetime Achievement (in 1987, from the Horror Writers Association), and the First Fandom Hall of Fame Award (1977).